Mr Howard said he was sorry for the inconvenience APEC would cause but the blame rested with the “ever present threat of terrorist attacks” and “those who want to practise violence amongst the ranks of the demonstrators”. So we thought it appropriate to summarise here, urbanism in the wake of The Meeting With The Signature Dress Up Day. Within the red zone, sit the politicians and the unfortunate residents that happen to be living in the area. 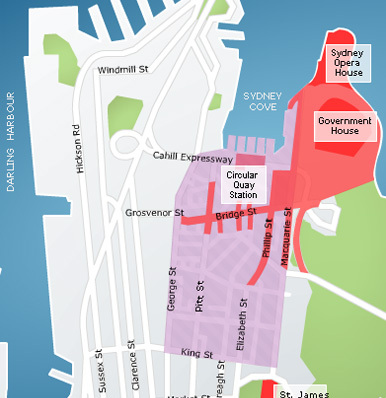 Immediately outside the fenced off/in area, in the purple shaded area, is The Declared Area - in which the NSW Police have been granted magical new abilities to search people for whatever reason they like. If they think that you look a little suspect, then the games over. The prisons have kindly kept some spare space for all the extra arrests expected over the course of the conference. 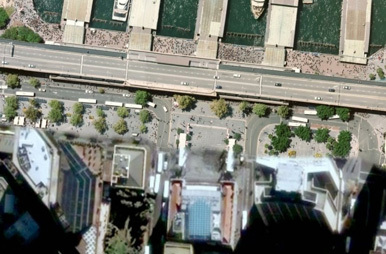 Earlier this year, Google, in a much publicised (locally at least) move, took a series of high resolution images of the Sydney CBD, bringing the city centre out of shadow and into sharp focus. Now, with APEC around the corner, and the ability to see pavements and rooftops in detail apparently becoming a real and imminent threat, Google’s images of the CBD have reverted to their old lo-res, in shadow crapness. This is nothing new in a sense, sensitive sites such as the Capital Building in Washington DC have long been fuzzier than their neighbours. However it feels odd for the city to suddenly get blurrier, while its surrounds gain fidelity. Not officially installed for APEC, but if not, then very timely. 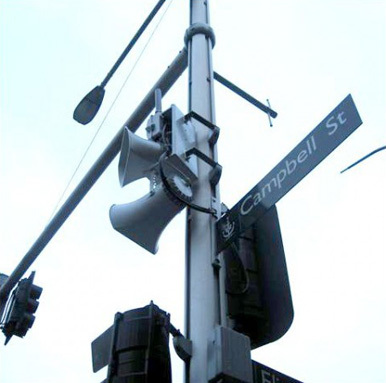 A series of loudspeakers started appearing on street corners a few weeks ago, their purpose initially unexplained. After a period of time, they were revealed to be warning systems should some (unprecedented) city-wide panic take place. Readers may not be aware that Equine Influenza has just broken out in Australia. There is one confirmed case at Randwick Racecourse. 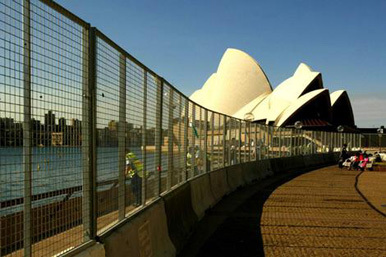 The multimillion dollar gambling industry that rests on the good health of its horse means that the entire equine population of Sydney is under quarantine. This also means that the NSW Mounted Police, those usually brought out to herd protesters into neat groups, has been grounded too. So, a new generation of crowd control is being used to combat the crowds of protesters. 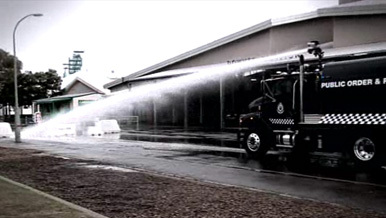 Meet Horse 2007: Water Cannon. A badass black, $600,000 water pistol. If it is a nice day, then I guess it could be quite refreshing.